(they call them “sweets” for some reason–I like it. It sounds so ’20s.) Brigadeiro is a chocolate treat that are served at kids’ birthday parties in Brazil, but I’ve been told adults will also make a pan of it and just scoop it out of the pan, before going to the trouble of rolling them in sprinkles. They are a great, quick treat that are amazingly good. Combine the three ingredients in a heavy saucepan and cook, constantly stirring, over medium to medium-low heat. After about six minutes, the mixture will boil (big bubbles). Keep cooking until the mixture starts pulling away from the sides of the pan and when you run a rubber spatula done the bottom of the pan, a thick streak remains before refilling. It will start to look dull on the edges, and lumpy in the middle (you will almost wonder if you haven’t been stirring it well enough, but when it cools, the lumps will disappear.) When the mixture has thickened to that point (another 2-3 minutes), remove from heat. Let cool about an hour (the mixture will thicken as it cools). The trick between great Brigadeiro and okay Brigadeiro is getting it off the heat before it cooks too much–this allows the chocolate to stay a melt-in-your-mouth texture. Fill a small bowl with the chocolate sprinkles. With buttered fingers or rubber gloves (if you don’t like to get messy), roll about 1 1/2 t. of the cocoa mixture into a ball, and then into the sprinkles. 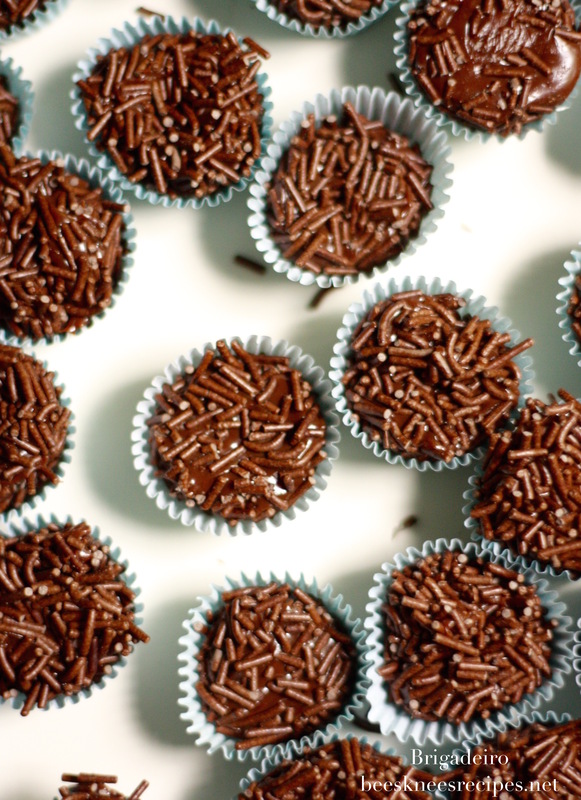 To serve, place on a tray, or place each Brigadeiro in a tiny cupcake liner thing. I don’t know what these are called, but it’s what I’ve seen Brazilians place them in (please advise). Enjoy! My two roommates in Chicago who served missions in Brazil used to make these. Addictive!